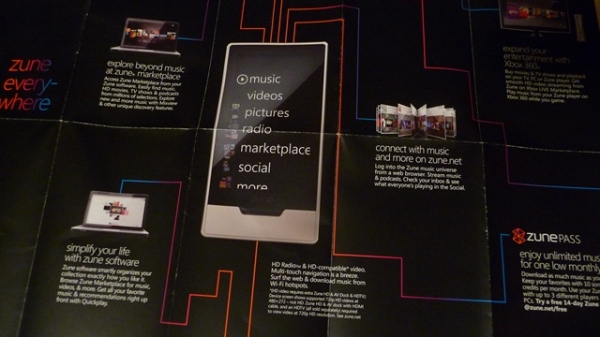 One thing I noticed during the hands-on demonstration I got with Zune HD was a fold-out pamphlet that came in the HD's box. A cursory glance at the contents appeared to reveal nothing important, but apparently there was a great deal I overlooked (including, incidentally, bringing a camera with me in the first place). Steve Hughes luckily remembered his, and took a number of pictures of the different areas of the pamphlet. Among others, it mentions HD movie downloads, music streaming from Zune.net, and something called QuickPlay. Xbox 360 Smooth Streaming is mentioned and demoed for Gizmodo Australia (the presenter at the event I attended told me the Zune HD could wirelessly stream to 360, but I haven't heard this corroborated anywhere else). Check the read link for some bonus shots of the newest generation of accessories and descriptions.